Sony launches X series midrange phones with hi-res audio support | What Hi-Fi? 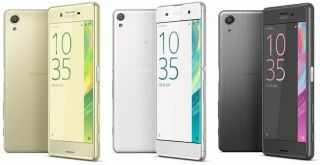 The new Sony X Series of phones has been launched at MWC 2016 and comprises three handsets: the Xperia X, Xperia X Performance and Xperia XA. It wasn't the new flagship phone some might have expected - the LG G5, Samsung Galaxy S7 and Galaxy S7 Edge stealing a march in that respect - but instead a range of phones to sit just below the company's top-tier Xperia Z5 and Z5 Premium. All three of the phones can play hi-res audio but there's nothing like the focus of the LG G5's Hi-Fi Plus DAC when it comes to audio quality. That said, Sony Mobile has a solid track record when it comes to mobile music performance. Elsewhere the main focus was on camera quality and battery life, as Sony aims for a mass market audience who might not want to shell-out on a flagship phone. The X and X Performance smartphones feature Sony's latest Xperia camera tech, with a new ‘Predictive Hybrid Autofocus’ feature. Sony claims this allows the 23-megapixel sensors to take focused, spur-of-the-moment pictures as it can “predict motion”. We’ll wait until we get some hands on time to find out how well that works. These two Xperia phones also come with 13MP front-facing cameras. The Xperia XA doesn’t have the predictive focus feature and comes with a 13MP camera instead. Under the hood of the Xperia X you’ll find a Snapdragon 650 processor with 3GB of RAM while the Xperia X Performance gets a performance boost thanks to a Snapdragon 820 processor with 3GB of RAM. The Xperia XA meanwhile makes do with a MediaTek chip and 2GB of RAM. Sony has said the phones have been given enough power to “make the most of their advanced capabilities”. Sony has had an impressive track record when it comes to battery life, and the X Series promises to deliver two days of life - so long as you use the various new battery management tools. Other features across the range include hi-res audio support, full HD displays, expandable storage and fingerprint readers. The design and styling have been kept relatively uniform across the range, as all three feature a curved glass display with a rounded frame, while the Xperia XA has an edge-to-edge display. Pricing and availability has yet to be announced but we’ll update this story as soon as we know more.